Most pool owners know that chlorine keeps your pool clean. They know that it helps make the water look clear and that it works to kill water-borne bacteria that can be harmful to your health. However, have you ever wondered exactly how it works though? Here’s a brief yet thorough explanation to help you understand what chlorine does to your pool and how it does it. 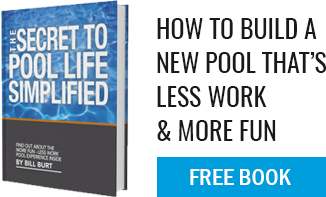 First, chlorine is typically added to a pool in the form of either a powdered or liquid solution. When added to pool water it breaks into a series of chemicals, two of the most important being hypochlorous acid (HOCl) and hypochlorite ion (OCi-). These two chemicals attack the cell walls of bacteria and other microorganisms in order to get to the structures inside the cells that oxidize them and render them harmless. What is unique about the combination of HOCl and OCl- though is that they oxidize bacteria at different rates and therefore pack a powerful one-two punch. The HOCl takes effect in seconds and attacks the bulk of bacteria cells while the OCl- waits in hiding and kicks in after 30 minutes or so to clean up the rest. Chlorine cannot function properly on its own however. Essential to proper sanitizing is also a balanced pH level of anywhere between 7 and 8 with 7.4 being the ideal. pH levels can be manipulated by the addition of basic solutions like baking soda to raise pH and acidic solutions like chlorine to lower it. Once chlorine is done killing bacteria, the HOCl and OCl- particles begin to disappear by either combining with other chemicals that end up in the water or by breaking down into single atoms through exposure to sunlight and heat. This is a regularly occurring process so pool water must be continuously monitored for chlorine levels and when levels drop below acceptable, chlorine must be added. The addition of chlorine to pool water has enabled us to keep crystal clear and sanitary backyard swimming pools for our families to safely enjoy but chlorine should still be treated like the acidic chemical that it is. High chlorine levels that are typically present immediately after a pool is shocked should be avoided as the solution will attempt to attack the cell walls in a swimmer’s skin, just as it does in a bacteria cell, and can cause irritation and rashes. Chlorine can also off-gas with the then airborne chemical hovering above the surface of the pool and cause breathing difficulties especially for children and those with chronic respiratory illnesses. For these reasons, the swimming pool industry has begin to develop chlorine alternatives that may be safer for human exposure like salt water sanitizing systems, the addition of alternative chemicals like bromine, or even ozone generating machines that are installed in-line with your pool’s plumbing. The bottom line is that chlorine and other sanitizing agents make it possible to enjoy clean and clear water, especially during the summer months when contaminating factors like higher rain fall and more regular pool parties can dirty up your pool water more often. Remember though that water chemistry is just one part of a proper pool maintenance routine. Don’t forget to keep a close eye on filters and pumps to prevent potentially costly future repairs!